Drivers in Peterborough have been hit by more queues after temporary traffic lights were placed in Bishop’s Road. 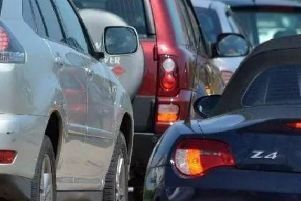 The three-way lights, which operate from 7pm to 6am, came in on Monday (June 19) at the mini-roundabout near the Lido and have led to long queues in all directions, with some motorists waiting for 20 minutes to get through, while vehicles have even been stopping on the Rivergate roundabout. The lights are due to be in place for a fortnight, the same period as the southbound slip-road onto the A1M at Haddon services is shut, while overnight closures on Bourges Boulevard have also been taking place this week. The works at Bishop’s Road began at the end of February and are due to end in the autumn. A Peterborough City Council spokeswoman said the lights “are for the Anglian Water works currently taking place. They started on Monday evening and are due to go on for two weeks. “They are taking the opportunity to repair the damaged sewer pipe which is located in the centre of Bishop’s Road. It has been like it for some time and Anglian Water haven’t fixed it so we said that we wanted the work completed before our project is finished to avoid digging the road up again in the future. “They have to operate three-way temporary lights because of the location and nature of the work. They are working overnight only (19:00 - 06:00) and re-opening a two-way flow during the day.